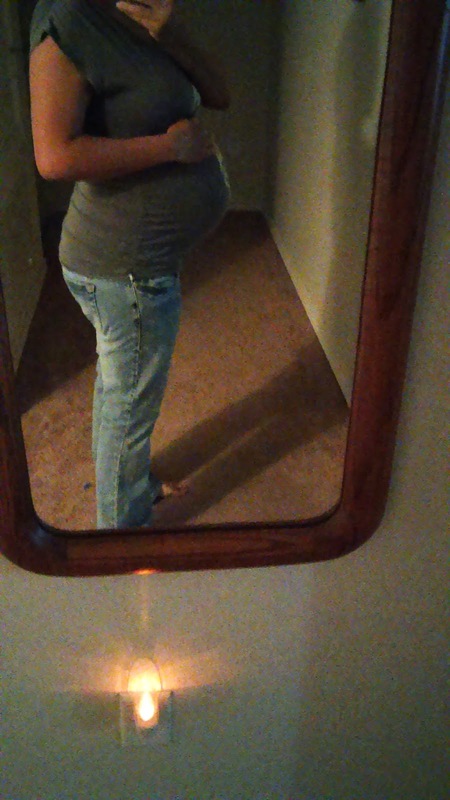 Had actually taken this pic the night that I was headed to the hospital, so no bare belly pic of 31 weeks. This was 30 weeks 6 days, so close enough. Alright, so I was hooked up to what seemed like a billion bags of antibiotics, Magnesium, and taking some meds to stop contractions. I was told I was going to have my blood drawn every 4 or 6 hours (something like that), to check my Mag toxicity levels. I also had the pleasure of having the blood pressure cuff go off every so often as well. It was so tight. Oh yeah, and I believe I had a sonogram sometime that day as well. If I'm leaving out any details, I'm sorry---there was SO much going on. There were nurses coming in and out and they were actually some of the sweetest people I've ever met. They made everything so much easier to handle and were all very easy to talk to. I might have driven some of them crazy with all of my questions, but I wanted to know every single thing that was happening to me. I was so nervous. I'm not going to lie---I cried off and on when no one was in the room. I did not want to have a c-section. I wanted to keep my baby girl safe in my tummy, but I was ready to do whatever I had to do. If she needed to be taken out, well then, I would have no choice. I prepared myself for the worst. My amazing husband spent the night there, looking so uncomfortable on the little sofa and freezing---I had the AC all the way up practically every day/night that I was there because thanks to the Magnesium, I couldn't feel the cold. Also, thanks to that stuff, everything looked a bit cloudy and strange. My husband and I watched movies together, we prayed together, meditated, and he massaged my feet and shoulders as often as he could. He is another reason I was able to keep my sanity in there.